Anyway, here is my card. And if you read the comments on Susan’s post, you’ll see that I did warn her that I’d be CASE’ing her card! If you haven’t heard the term ‘CASE’ before, it’s an acronym that stands for Copy And Share Everything. That sort of frees up the guilty feeling when you’re making a card that’s just like someone else’s! Usually I do make some changes, and add or take away something from the original design. This time, the only thing I added was the layer of Basic Black cardstock. Another thing I loved about this card, that Susan made, is that it comes together so quickly! And yet it looks so stylish. Simply cut a strip of the Color Theory Designer Series Paper, and a piece of Berry Burst cardstock. While keeping them butted up to each other, stamp the branch, flowers and sentiment from the Colorful Seasons stamp set in Basic Black ink. Holding the papers together allows you to stamp the branch and flowers across both papers at once, without having to worry about lining them up, if they were stamped separately. Layer the DSP and cardstock on top of a 3 3/4″ x 5″ panel of Whisper White cardstock, using Stampin’ Dimensionals. Next, layer that on top of a 4″ x 5 1/4″ panel of Basic Black cardstock. 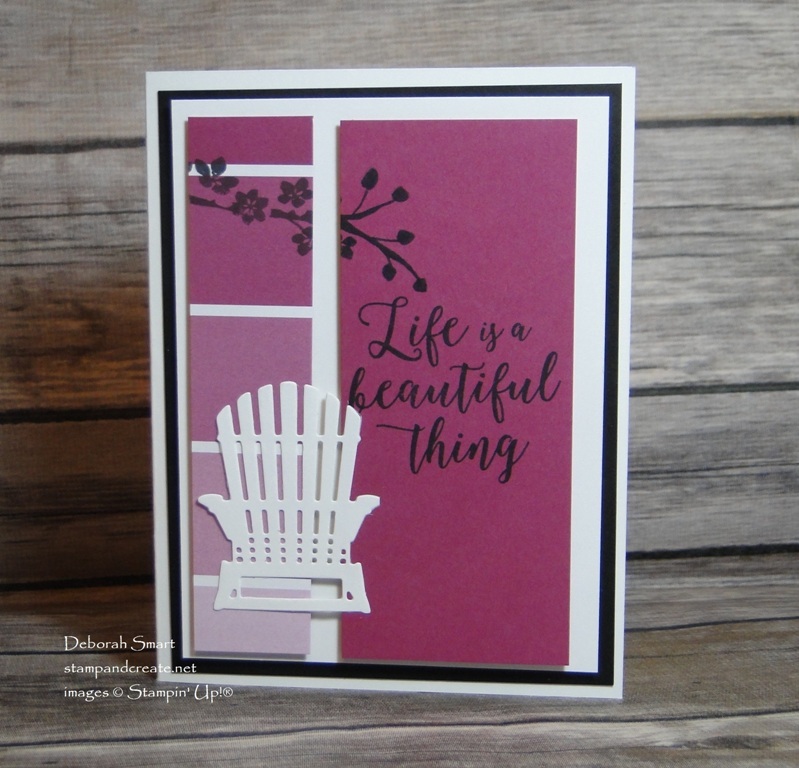 Die cut the Adirondack chair from Whisper White cardstock using the Big Shot and Seasonal Layers Thinlits Dies. I find using the Mini Glue Dots to attach these detailed die cuts the easiest, as you can ‘roll’ them between your fingers, to make them skinnier! The entire front panels are then attached to the Whisper White card base. If you’d like to be like me, and copy Susan’s card ;), you can click on the images below to order your supplies. And remember that this is Bonus Month – so if you order the Colorful Seasons Bundle (#145348 $69.25 thinlits and stamp set) you’ll automatically qualify for a $6 Coupon Code, redeemable during August on any order!